My goal for the month of December is to post one “winter” themed piece a week. We’ll see if I actually succeed, but I think it is super important to set goals. To start with, here is snow princess paper doll dress. Fairy tales were a huge part of my childhood. Even after I was “too old” for picture books, I would go to the section in the library devoted to fairy tales and spend hours reading different versions of my favorite stories. I loved the variety of ways of telling the same story. Clearly, I love all things fairy tale related and that includes a love of princess fantasy gowns. 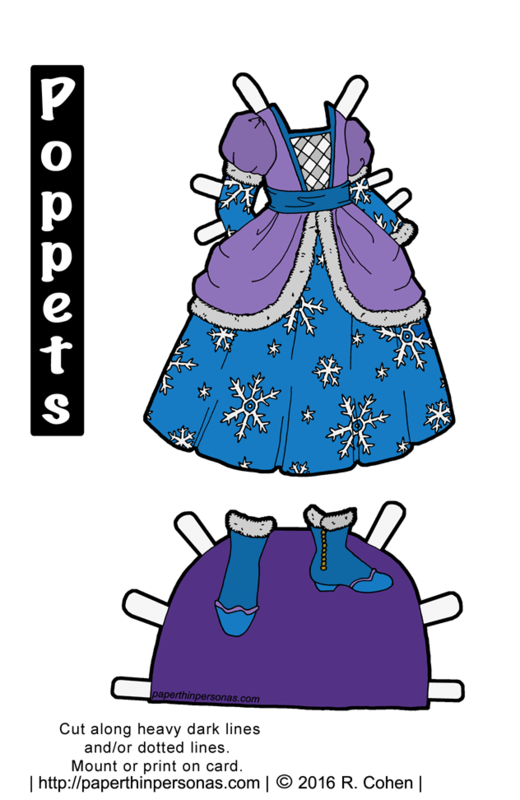 It has been a long time since I did an over the top princess dress for the Poppet series. Every child paper doll paper needs an over the top princess dress. This snow princess paper doll dress was inspired by 18th century Rococo designs, specifically polonaise dresses. These gowns were known for their draped and swagged over skirts. I have always loved the style. Meanwhile, this Poppet gown has some practical short boots for tromping through the snow and long sleeves to keep her warm. When it comes to winter fairy tales, which ones are your favorites? I confess a love for the Snow Queen and Snow Child, a story about a childless couple who make a child out of snow that comes to life. I think it is Russian in origin. Any other recommendations for winter fairy tales? Let me know in a comment. If you want to support the blog become a patron where there’s behind the scenes updates, another paper doll series, and other fun things. I love that fairy tale. So beautiful! I love the blues & purples. And yay for winter themed paper dolls!